Start off your New Year right! Dr. Krysten DeSouza, who will be tak­ing care of my prac­tice dur­ing my mater­nity leave, will be guid­ing people to eat bet­ter and take care them­selves this com­ing January! You know who you are that would bene­fit from this kind of guid­ance! Week 3: 15- minute fol­low-up assess­ment dis­cuss­ing your pro­gress and how to incor­por­ate into your daily routine. 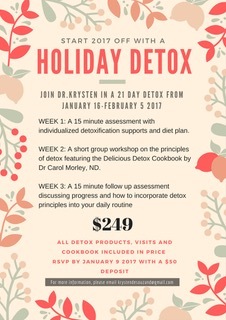 Sign up by January 9 and email drkrystennd@draoife.com or krystendesouzand@gmail.com.